Wow, it's been over a month since an article has been posted! My apologies to all, but I have been working very hard on self-healing, and working with the incredible energies of the last 3 eclipses that occurred in rapid succession! Back near the end of April, I received a flood of emails from different astrology websites and blogs that described the intense "happenings" over the following 5-6 weeks. Around April 25th-26th, there was a Full Moon Eclipse in Scorpio, and then a New Moon/Solar Eclipse in Taurus (with solar flares, too!) around May 9th-10th, and then a final Full Moon Eclipse in Sagittarius on May 25th! I had only ever joined in a sweat lodge one other time in my life; a Sister Sweat held in Bel Air, MD, by dear friends Leanne and Mark. This sweat occurred in January, and although I remember the ordeal, I don't remember anything that was said! I vowed to better prepare for the sweat at the end of April, so that I could write notes in my notebook, and last the whole way through. The purpose of a Sweat Lodge is to Release things into the Lodge that no longer serve you (ideas, fears, emotions, etc.) and ask the Spirits to bless you with new things that you want to Invite into your life (opportunities, prosperity, blessings, etc.). Each culture and tradition has its own way of conducting a Sweat Lodge (this is not just a Native American thing; see Wikipedia and Google ). Preparing for a sweat is like preparing for the longest, hottest, sweatiest day of hiking ever. I woke up after a full night's sleep, ate a light breakfast (granola bars, a banana, and small iced coffee), and hydrated with almost two water bottles in the 3-hour drive to Seelie Court in Delaware. Everyone usually has their own lists of What Not To Do/Eat, but I stayed away from alcohol for 3-4 days, refrained from heavy foods (fast food, meats (sushi ok for me! ), too much bread, etc. ), and completed a Two Powers meditation before entering in the Sweat Lodge. I felt grounded and centered in my body, but still felt a slight "buzz" on my skin from excitement and spiritual thoughts. Each culture/religion uses their own methods of Sweat Lodge, but some of the characters are the same. The Water-Pourer sits with all members inside the lodge, leads the meditations, pours water over the stones (called "Ancient Ones" in many traditions), and monitors everyone's health. The Fire-Tenders heat the Sacred Stones in a special fire, and brings them into the center of the Sweat Lodge. The Kitchen-Witches cook numerous foods, for after the Sweat Lodge Ceremony, and monitor everyone's health afterwards. In my very psychologically-framed mind, a Sweat Lodge has always felt like the most spiritual form of Group Therapy! Everyone enters the Sweat Lodge as individuals, but as ritual purification begins (of body, mind, and spirit) in TOTAL DARKNESS, everyone has the chance to speak their truth in a powerful and anonymous way. It is taboo to speak of another's words from Sweat Lodge, as the ordeal brings each person closer to their own Spirits. However, I would like to write of my own releasing in a very general way. This Sweat Lodge, I focused on my own personal self-healing, more so that in general healing treatments that I do for myself. I am learning how to speak my own Truth, and re-learn what I already know. For example, I write many many notes in many many journals, but almost never review them or read over them again. I am working on cementing that knowledge into my brain, so that I can communicate better. I purchased a specific stone to help me with the lessons of this Eclipse & Sweat Lodge: Black Moonstone. 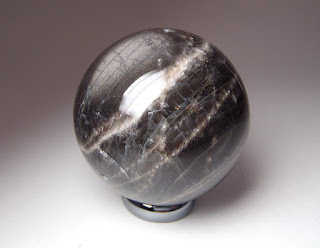 There are numerous metaphysical properties of Black Moonstone, but I was searching for one specifically to help me with deep, internal Shadow Work (Jungian stuff). With the full moon in Scorpio, and Saturn retrograde through Scorpio, and my own birth day in Scorpio, I was definitely feeling the movement within my mind and soul! I also purchased one in the shape of an Egg, a Druid's Egg, to be precise. As I began working with the lessons of the Full Moon Eclipse (releasing of old habits, sudden lessons from the past, and large jumps in the growth of my Intuition), I began noticing subtle changes in myself and my environment, leading up to the New Moon/Solar Eclipse at the beginning of May. But, that is for another blog entry! If you could join a Sweat Lodge for healing, what would YOU release into the steam, so that you leave feeling lighter?? *Sweat Lodges have certainly been in the news lately, with criminal trial proceedings, questions of cultural appropriation, etc. Almost all cultures have used ritual sweating as purification (Native Americans, Indo-Europeans, Celts, Norse, Asian cultures, etc. ), and so it pays to research which type of Sweat you would like to join. I warn all readers to research all Sweat Lodges thoroughly, and ask after the Water-Pourer's certifications, before trusting your body to the ordeal.